more than have been propagandized by all the political tracts of the world. There can be no doubt of the significance of this one movie and its impact on our lives. If you care about the future, set your V-chip to block Oz. that heroism is a hollow joke. Accompanied by song and dance, these principles are expressed forcibly in dialogue. that courage means conquering fear. Scarecrow wanted Oz to give him a brain. 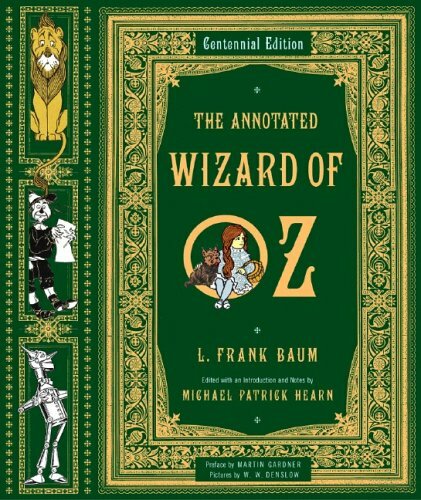 In Chapter XV of Baum's novel, Toto unmasks Oz, and Dorothy renames him "The Great and Terrible Humbug." But Scarecrow gets his wish -- pins and needles mixed with bran to replace cerebral straw. Later he draws a distinction between intelligence and education by saying, "When I get used to my brains I shall know everything." In the movie, as nearly every inhabitant of the planet will recall, Oz asserts that back where he came from, people function well enough with no more brains than Scarecrow's, but they have something he does not have -- a diploma. Scarecrow clutches his rolled-up parchment and promptly recites the Pythagorus Theorem (incorrectly, truth be known). So much for classrooms and teachers, textbooks and homework. Tin Woodman wanted a heart. In Baum's novel, the de-throned Oz tin-snips a hole in his chest and installs a piece of silk stuffed with sawdust. Tin Woodman thanks Oz for his kindness and vows to "bear all the unhappiness without a murmur," giving compassion a solemn nobility. The screen version allows Oz a smirk and the observation that back where he came from, people have no more heart than Tin Woodman, but they have something he does not have -- a testimonial. Thus, Albert Schweitzer and Mother Theresa lacked true compassion -- until their good works were recognized by the Nobel Committee. Cowardly Lion wanted courage. Baum's bogus -- but sagacious -- Oz pretends to take care of that with a foul tasting liquid, having earlier given valor its discretionary part, "True courage is in facing danger when you are afraid." The movie belittles the bravery of every person who has been called upon to accept mortal risk. The Hollywood Oz declares that back where he came from, people get by with no more courage than what Cowardly Lion has, but they have something he does not have -- a medal. That's cynicism not satire. And more destructive than all the pyrotechnics and vulgarities in R-rated blockbusters. efenders of The Wizard of Oz will doubtless begin with the lamest of arguments: It's only a movie. The Sermon on the Mount was only a speech. That mere children constitute its audience hardly needs rejoinder. All teachers, all members of congress, all business leaders of today were once children, and all of them have more than once heard the call to "follow the yellow-brick road." The film emphatically develops the character of Oz as a phony, first in Kansas (as a snake-oil merchant) and later in Dorothy's hallucinations brought on by head-trauma. Oz, as Technicolor Wizard, orders Dorothy and her friends to assassinate his rival, The Wicked Witch of the West. Which they reluctantly set about to do -- and succeed, albeit inadvertently. Such is the moral price paid for diploma, testimonial, and medal. That's curious. The characters repeatedly deny these qualities in themselves, and Dorothy is heard to say, "I like you just the way you are" (brainless, heartless, and gutless). As an adult, I wonder why Dorothy's three companions -- ostensibly bright, sensitive, and assertive -- collaborated in a felony in order to qualify for the personal attributes they so earnestly seek. Where do children acquire their critical thinking skills? If, by any chance, values learned in The Emerald City are not discarded but reinforced along the way, then how confidently do we predict that virtue will ultimately prevail? Does the maturing mind disparage cynicism or embrace it? Cowardly Lion in military ranks and law enforcement.